The nib on this specimen is a fine, triple-flexible, and the pen is complete with original box. Note the inscription on the top of the lid: Not Connected With The L.E. 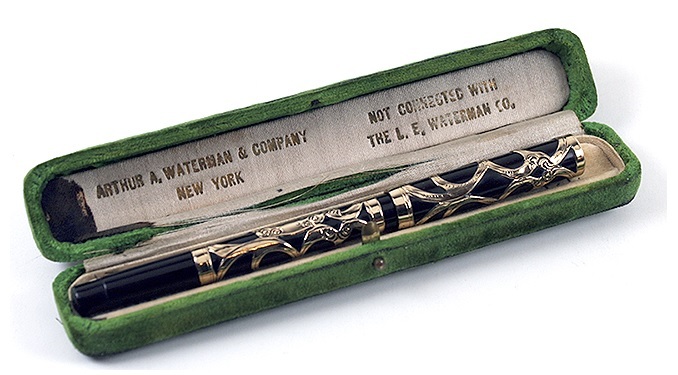 Waterman Co.
A lovely pen, but is no longer available. Browse Catalog #74 for other great pens! This entry was posted in Vintage Pens and tagged Extraordinary Pens, Flex Nib, Waterman. Bookmark the permalink. Follow any comments here with the RSS feed for this post. Post a comment or leave a trackback: Trackback URL.